Fraction high still but I'm talking about literally a fraction. Sulphate wagon compared to bogie brick and Peco van. Close up of the buffer heights between the Peco van and Sulphate wagon. Sorry about the blurred photo, I've tried to get my phone camera to take a more in focus picture without success. What you can see though is that all I've done is to file the protrusion that held the bogie pivot pin flush with the cross member. I've also cut off the coupling pocket as I'm either going to make this part of a fixed rake or add some DG couplings (cheaper that Dapol magnetic couplings!). There really isn't much more that could be taken off without creating clearance issues; I've tested both the NER bogie van and sulphate wagon around Kato 9 3/4 curves without problems but obviously not coupled to anything yet. Thanks Steve. Interesting as I always assumed these were pre-nationalisation and didn't last as there seem to be very few (if any) photos about of them in BR days. The dropping of the "up on stilts" look is a massive improvement, though I think the BR livery that Grafar used is probably a bit dark. Looking up online, I've read a few sources saying that these ran sheeted (with tarps) in BR days, so might be worth looking up whether this was also true in LNER days. I think that almost certainly they did run with tarps when loaded. 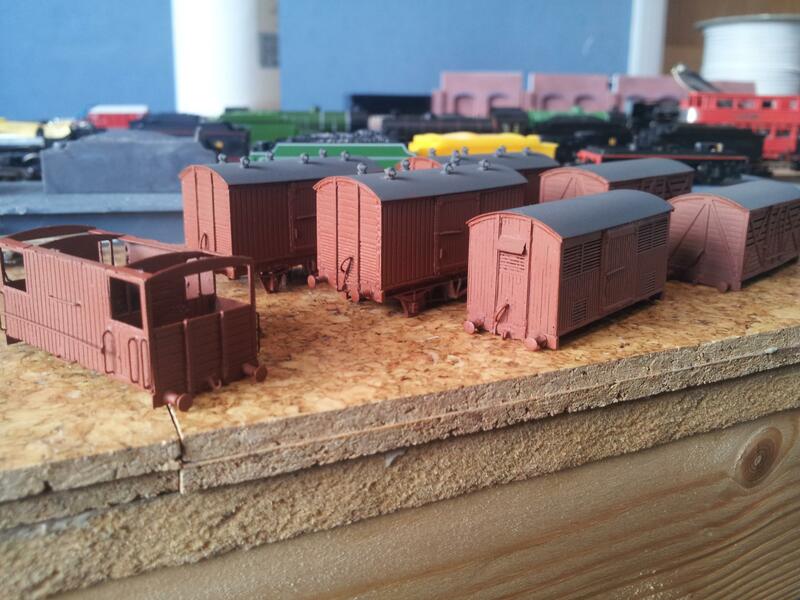 However, I've not decided if my two are going to be represented as loaded wagons or not yet. Thanks Steve, is the brick wagon a kit? Hi Paddy, its one of my 3D prints. Thank you. I've just sent you a PM. Deciding to take Hailstones's advice on my locomotive thread to start/do something else to see if some missing 'safely placed' parts turn up, I decided to finally get around to lettering and numbering some wagons. First to receive this treatment were my bogie brick wagons. 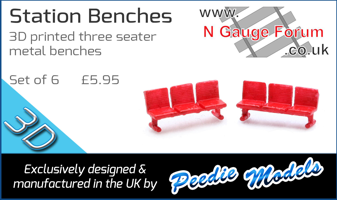 I wasn't looking forward to this as nobody makes brick wagon transfers in N gauge which means I'd have to be finding the best match of lettering from Fox Transfers and making up the working from individual letters. This has resulted in a not quite perfect match but something that I feel is acceptable. Both wagons are based on photos and luckily the left hand wagon doesn't have 'Return to Fletton' on it nor the non common user 'N' at either end which made life so much simpler for this one. I'm not looking forward to having the letter 'Perishables' onto one side of one of the etched vans but the fruit and fish vans should be easier. Hi Steve, love your work and i want some brick wagons lol. Found this site for transfers yesterday, they maybe what you are looking for. Happy Modelling Steve. Thanks Steve. I'm happy that they are coming along but I'm going to need a lot more transfers. I'm toying with the idea of producing a paint mask for the large 'NE' which will adorn most of my LNER wagon fleet. It won't help with numbers and other lettering but it'll be something. I'm very interested to see the page you refer to, unfortunately the link isn't visible on your post. It’s Rod by the way...lol. Happy Modelling Steve. Thanks for that Rod, those BR crests look good and reasonably priced. Sorry about the confusion, I wasn't sure if you were signing off or wishing me well - I know now!